The greatest supergroup on the planet have decided to tackle the crazy world of cartoon music. Heaven help us all. Fantomas's 2004 opus Delirium Cordia ranks as one of the scariest albums to be unleashed upon the public in recent memory, a single-track, 74-minute metal/jazz fusion/post rock extravaganza that brought the listener deep into the darkest realms of the subconscious, sonically assaulting us at every chance, always looking for the next stone to overturn, in order to examine with demented glee the grotesquerie that lurked beneath. Ominous, wildly inventive, and genuinely frightening, it remains, in this writer's opinion, one of the most disturbingly accurate musical interpretations of the nightmare experience ever recorded. Arguably the most talented "supergroup" today, featuring vocal mastermind (and overall renaissance dude) Mike Patton, guitarist Buzz Osborne from the legendary Melvins, versatile bassist Trevor Dunn (formerly of Patton's Mr. Bungle), and the great Slayer drummer Dave Lombardo, the quartet have collaborated on four albums now, each member bringing his own unique touch to the compositions. Patton's over-the-top, nonverbal caterwauling, Osborne's grinding chords, Dunn's astonishing bass work that leaps from jazz to funk to metal instantaneously, and Lombardo's frenzied drum clinic, all made for a blend that worked incredibly well on 1999's sci-fi themed Fantomas, 2001's collection of film score interpretations The Director's Cut, and the aforementioned Delirium Cordia. Displaying an uncanny ability to continually pull the rug out from underneath their collective audience, it was anybody's guess as to what Fantomas would do next, and to their credit, they've done it again, taking their sound into yet another uncharted territory, and leaving us shaking our heads in the process. This time, Fantomas has decided to take on the complex, intricate, challenging, and highly demented world of cartoon music. Directly influenced by the legendary Warner Brothers cartoon composers Carl Stalling, Milt Franklyn, and Raymond Scott, as well as Warner's great sound effects guru Treg Brown, Suspended Animation attempts to match the convoluted arrangements and comedic quality of classic cartoon scores, albeit in an extremely intensified, Fantomas-style way (Brown's distinctive sounds are also sampled on the record). In direct contrast to Delirium Cordia's sprawling, experimental, hour-and-a-quarter song, Suspended Animation bears a small similarity to Patton and Dunn's previous work with Mr. Bungle, the CD divided into 30 brief, choppy tracks that play over a meager 43 minutes (with each song being named after each day in April), making this a far more inviting album, one that many people will find easier to enjoy. The result is a fascinating blend of the macabre and the lighthearted, something that will appeal to anyone who appreciates the darker side of both comedy and music. Stalling's famous Looney Tunes scores are notable for their difficulty to play, the vibrant music throwing logic out the window, the convoluted arrangements serving as much more than a backdrop to the animation, enhancing it greatly, to the point where hearing only the music enables people to visualize the on-screen actions would be. Fantomas clearly pays homage to that onomatopoeic style of Stalling's, be it the ascending and descending notes that accompanied a tiptoeing Bugs Bunny, the ominous, bass-heavy chords that accentuated the stomp of a monstrous creature, or the slide Hawaiian guitar that marks the famous opening to the Looney Tunes theme. The overall performance of the band is as mesmerizing as you'd expect, but what's especially impressive is how much the four members elevate their playing, providing evocative, ambient sounds, and then shifting abruptly into a wild combination of math rock and speed metal (perfectly exemplified by the uproarious "04/29/05"). As incredibly self-indulgent as it may sound at first, the music here is especially tight, the entire album anchored by Lombardo's sharp drumming, coming off as equal parts metal and jazz. Patton, mad genius that he is, is all over this record, spewing countless of overdubbed bursts of rhythmic vocal gibberish that would make Japanese a cappella artist Dokaka proud, with always fascinating, and often hilarious results. In fact, it's impossible to hear tracks like "04/03/05" and "04/07/05" and not crack a smile. Accompanied by a lavish, 30-page calendar that displays the illustrations of notable Japanese artist Yoshimoto Nara, the various images of cutely-drawn children wearing adult expressions encapsulates the balance the band achieves between the lighthearted and the dismal, and in the same way people are either disturbed or amused by the drawings, they will either be drawn to Suspended Animation or repelled by it. Those who do give it a chance are in for a treat. 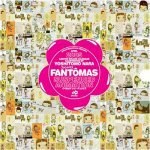 As if in response to those who think Fantomas's version of cartoon music is too overwhelming and dismal, this ingenious little album concludes with the famous pay-off line from the classic Bugs Bunny toon, "What's Opera, Doc", that says all that needs to be said: "Well, what did you expect... a happy ending?"